On Friday 21 October at the Brücke Museum in Berlin, ECLA faculty member Aya Soika presented, in collaboration with the executors of his estate, her catalogue of and commentary upon the work of Max Pechstein. The results were no light production. Weighing in at 8.4 kilograms, with 1188 pages and 1340 illustrations, the labour-intensive project took seven years to complete. Research for the project began at the University of Cambridge where Aya investigated the idea of “Raumkunst” (interior design art) important to the Expressionist movement “Die Brücke”, an attempt by the artists to go beyond the frame of the canvas to create total artworks that bridge different art disciplines. In order to pursue this aim the artists had to be incredibly versatile in their experiments. Pechstein, a leading figure of “Die Brücke” until his expulsion in 1912, excels at this versatility: he was trained as a decorative painter and began his artistic career creating murals, glass painting and mosaics. Only later in his career did he immerse himself in painting. This extensive catalogue focuses on his oil paintings but extends the genre “catalogue raisonné” by going beyond a mere encyclopedic documentation of each painting to convey Pechstein’s aims and struggles in a thematic as well as an historical context. Pechstein’s experiences epitomized those of a whole generation of German Expressionists brought up in Wilhelmine Germany who survived the First World War, flourished in the Weimar Republic, and were eventually persecuted by the Nazi Regime. As Aya made clear in her presentation, the project is of necessity shot through by “voids”—the losses inflicted on the artist’s own collection of his work by the Second World War; the confiscations imposed by the Nazis in their classification of it—along with that of other contemporaries—as “degenerate”. Even with the exhaustive compilation and investigative labour of the collection, there remains the possibility of permanent loss and ultimate mystery: “It is hard to estimate how much we have managed to collect of Pechstein’s oeuvre. We might have gathered eighty per cent. I assume there are hundreds of paintings we don’t know about”, said Aya in the panel discussion following her talk. These “voids” also created another obstacle that that the labour of compiling the collection had to confront: the exploitation by forgers of the apparent disappearance of works by Pechstein for which sketches exist. 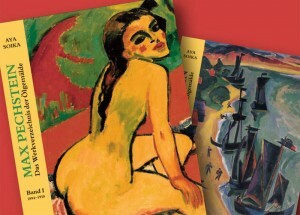 The main culprit, Wolfgang Beltracchi, was recently sentenced to seven years in prison for forging, among other works purchased at very high value, two Max Pechstein paintings. The careful work of assembling the catalogue—documenting paintings and verifying their provenance—was in part responsible for uncovering this forgery scandal, the most significant in post-war German history.